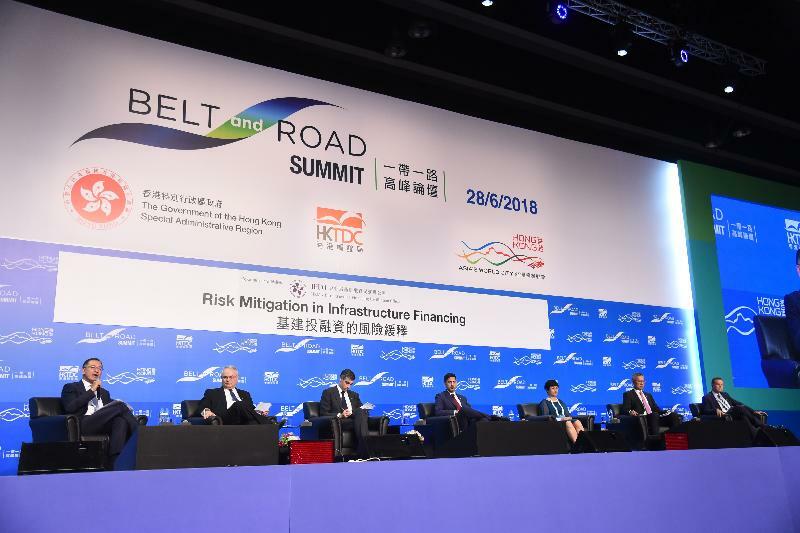 The Hong Kong Monetary Authority (HKMA) Infrastructure Financing Facilitation Office (IFFO) took part in the third Belt and Road Summit today (June 28) by hosting a panel discussion on "Risk Mitigation in Infrastructure Financing". The panel discussion attracted over 1 000 Hong Kong, Mainland China and overseas participants. Given the vast infrastructure financing needs, attracting private sector capital is crucial. However, participation of private sector capital in infrastructure financing in these economies have been limited due to concerns over different types of risks, such as political and legal risks at country level as well as construction, operation and financial risks at project level. Therefore, properly mitigating these risks is most critical to improving the bankability of infrastructure projects. The panel looked into these risk factors hindering private sector capital's participation and discussed the corresponding mitigation solutions. The Panel Discussion was moderated by Deputy Chief Executive of the Hong Kong Monetary Authority and Director of the Infrastructure Financing Facilitation Office Mr Eddie Yue and attended by the following guests (in alphabetical order of organisation name) as speakers: the PRC Leader and Senior Vice President, Asia Pacific, AECOM, Mr Ian Chung; the Executive Director and Chief Financial Officer of CLP Holdings Limited, Mr Geert Peeters; the Chief Representative, Hong Kong Representative Office, the Export-Import Bank of China, Ms Wen Hong; the Chief Operating Officer of Global Infrastructure Hub, Mr Mark Moseley; Co-Head of the Infrastructure and Real Estate Group, Asia-Pacific, the Hongkong and Shanghai Banking Corporation Limited, Mr James Cameron; and the Head of Credit Lines, Asia Pacific, Zurich Insurance Company Ltd, Mr Tim Warren. For more information about IFFO, please visit www.iffo.org.hk.